It’s easier than you thought! The Detroit Auto Show is always an interesting visit for the RV Lifestyle tech editors. Garth and I have been enjoying the press preview days at this industry event for many years. During the press days you have the opportunity to speak with many of the vehicle engineers and designers who would be difficult to reach at any other time, and this allows us to find out specs and learn about the design priorities for the new models. 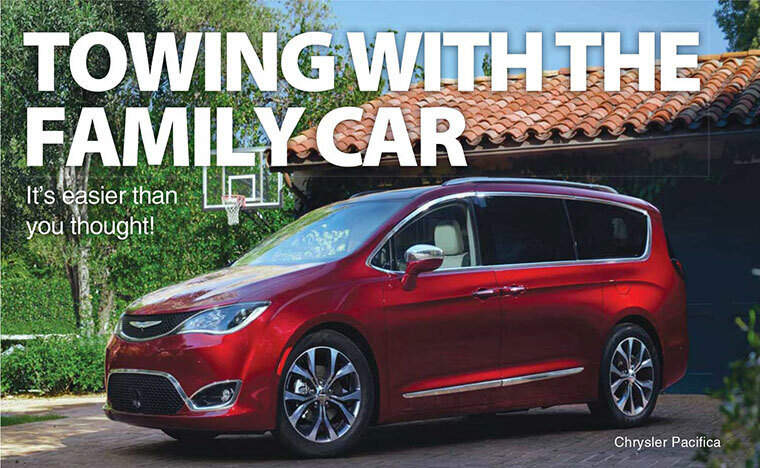 For RV enthusiasts looking at new family vehicles that can handle the task of towing an RV, it is quite likely that the new vehicle with the most interest is the all new Chrysler Pacifica. Chrysler has done a great job of styling this vehicle, which is essentially a van, to look like an SUV. Both the exterior and interior are quite attractive and it just may end the “soccer Mom vans aren’t cool” stigma. More important than the styling of the 2016 Pacifica is the roster of technical enhancements. The engine remains the very efficient 3.6 Litre Pentastar V6, but it is now mated to the same 9-speed transmission we have been testing in our Jeep Cherokee. There will also be a Hybrid version of the Pacifica that will be capable of 30 kilometres of pure electric operation. Often, the Hybrid drive trains are mated to smaller engines relying on the combined performance of the electric and gasoline engines to maintain the performance level. In the Pacifica, the Hybrid keeps the 3.6 Litre engine, and adds two electric motors for even more performance. The question mark in the Hybrid model will be the all-new transmission – we will have to wait and see if it is durable enough for towing duties. The existing Caravan is a very nice handling tow vehicle, but the Pacifica should be even better with fully independent rear suspension, perfect sized 245/50R x 20” tires that have almost zero sidewall sway, and a lower centre of gravity. 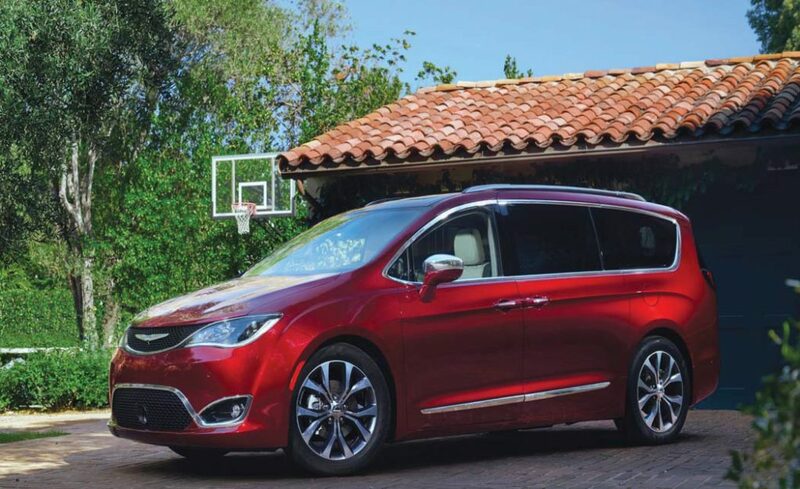 Chrysler tells us that the Pacifica body structure is stronger, and the interior is quieter than the Caravan. I am sure that the Pacifica won’t be as low priced as the existing Caravan, but it should still be a great value for what is likely to be one of the best handling tow vehicles at any price point. Another interesting new vehicle is the GMC Acadia. Until now, the Buick Enclave, Chevrolet Traverse, and the Acadia have been almost identical. Until now, GM really did not have an answer for mid-size SUV’s such as the Ford Edge. The new Acadia has a 6” shorter wheelbase and 6” less overall length, so the rear overhang percentage is slightly longer. Everything else about the handling has been improved, starting with 235/55R x 20” tires (again with very little sidewall roll), better shock dampening, and a little firmer suspension tuning. The redesign has trimmed around 450 pounds from the weight, lowering the centre of gravity and giving the Acadia a crisper, livelier feel. The Acadia’s 3.6-litre engine has been further enhanced and now produces 310 HP. The Acadia is also available in all-terrain trim which gives it enhanced off-road capability. Ford’s big introduction at the Detroit Auto Show was the new version of the Raptor pick-up base, on the aluminum F150. This is the first application of the new GM/Ford 10 speed transmission. The 6 speed transmission used in a variety of GM SUV’s and Sedans since 2008 is also a GM/Ford joint venture. This has been a great transmission – I imagine the 10 speed will be as well. The old Raptor had a 6.2-litre engine, the new one has a re-engineered version of the 3.5 Ecoboost engine producing around 450 HP. The Raptor’s massive 315/70 x 17” LT tires (which I am sure are fantastic off road) would not be your first choice for towing, but they could be changed in size a little. The Ford engineers must have been working to get every ounce of weight out of the Raptor as they went to a lighter trailer hitch than the regular F150, but again, this would not be hard to strengthen. With the tires and hitch fixed this Raptor would be one hot pickup truck to tow with, and it would still be amazing off road, but it will be expensive, so it is likely better to wait for the 10-speed to arrive in the regular F150. 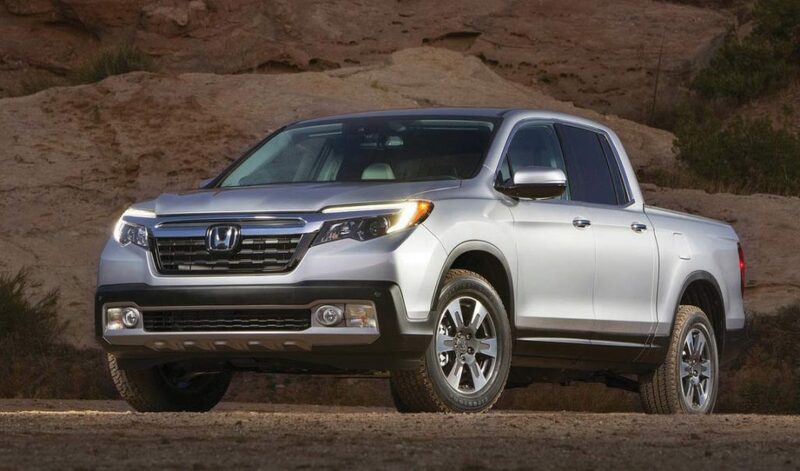 The other “new/old” pickup to arrive at the Detroit Auto Show was the 2017 Honda Ridgeline. It now has a 6-speed transmission instead of a 5-speed, and continues to offer Honda’s excellent 3.5-litre motor. In most respects it is similar to the old Ridgeline, which is good because the old Ridgeline had a great chassis and some very nice innovations such as the two way tailgate and the trunk under the bed floor. We had many customers who towed with the Ridgeline and there are only two complaints: the 3.5-litre motor does not have enough power for trailers with poor aerodynamics, and it was not the prettiest vehicle out there. The new Ridgeline is much more attractive. My only complaint on the new one is the choice of standard P265/60 x 18” tires which have substantial sidewall sway. So you have this great suspension and then mess it up with lousy tires. The good news is that you can easily change the tires to P235/55R x 18” XL (extra load) and take advantage of that nice suspension. The handling difference is so dramatic I would change the tires even if I never towed anything. The first modern cars we towed with were the full size front wheel drive sedans of the late 80’s, and over the years we set up hundreds of them. In general, this category has fallen a little behind other sedans as tow vehicles, but the new Buick LaCross looks interesting, with a 2.6” longer wheel base, a wider stance, and 3” less rear overhang. It also has GM’s excellent 3.6-litre motor with 350 HP but it is now connected to an 8-speed transmission and has the option of All Wheel Drive. It just might be time to put a GM sedan in our tow vehicle stable again. The first crossover SUV we ever towed with was a 1999 Lexus RX 300. Today, crossovers are the most popular tow vehicles we set up. 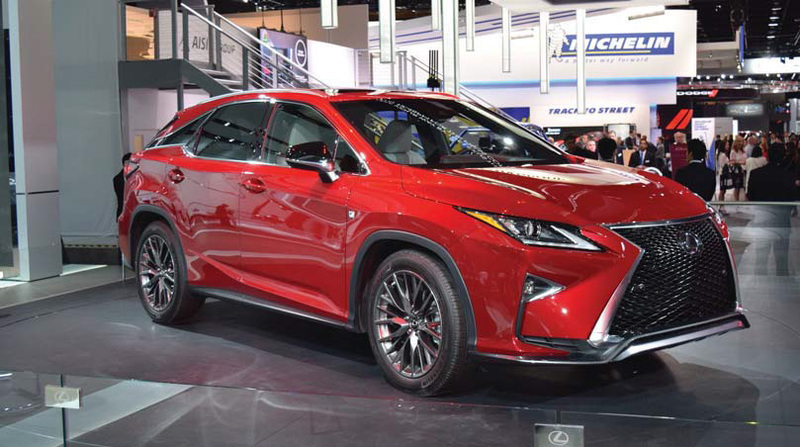 The RX has been updated over the years and now has a 3.5-litre engine with an 8-speed transmission. It is the only Hybrid vehicle that is well proven for towing – it just has been overshadowed by some of the diesel SUV’s you can purchase for about the same price. The Lexus has always been quite capable in every respect; it just looked kind of boring. The styling of the new model has been refreshed and I think it may now be one of the best looking SUVs on the road. One of the neatest innovations I saw at the show had nothing to do with towing. We checked out a 2016 Toyota SUV with a built-in satellite dish that is flat and uses no moving parts. It is capable of carrying more data than cellular networks, and of course it will work everywhere. The new technology will be capable of handling internet, television etc. This is a joint venture with Toyota and a company called Kymeta, so in three or four years or so your car may be your Wi-Fi, internet hub, and satellite TV receiver wherever you travel. Down the road this may be a system that can be added to an RV without the complexity of bulky moving dishes. If you ever get chance to visit the Detroit show I am sure you will really enjoy the experience. The Cobo Centre is only about half a mile from the Windsor/Detroit Tunnel. They spent $200 million putting this show together – the displays and information are really something to see. The Detroit Auto Show attracts 200,000 people over a weekend so if you head that way in January 2017 try and go on a week day!